You love the look of a plank wood floor. But your lifestyle dictates that real wood would be a mistake. What do you do? Invest in plank vinyl flooring instead. Over the past few years, plank vinyl flooring has skyrocketed in popularity for this very reason. Plank wood gives a fresh, unique look to your home. And with today’s technology and manufacturing options, vinyl options have greatly improved, converting even the most sophisticated buyers with its look and feel. The best place to start is by comparing. If you’ve never looked at plank vinyl before, come in and view it with your own eyes. Compare it to real plank wood, laminate, and even to ceramic or porcelain tile. Different materials bring on different characteristics, so its important to understand how it will look as a finished product. Overall, plank vinyl will be comparable in price to ceramic or porcelain tile. However, you won’t have the extra cost of thinset and grout, which can give plank vinyl the cost benefit. 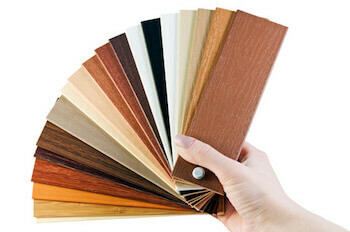 Its also comparable in price to laminate, depending on the style and brand you choose. Vinyl plank flooring comes either with self-stick backing that sticks together as opposed to clicks, or in click and lock format. Like most flooring option, cheap isn’t better, and in fact can have you replacing your flooring in a fraction of time as upgrading your investment even a small amount. By investing a little more, you can find vinyl plank flooring with single board installation, mimicking the look and feel of real wood. Each plank reproduces the look of a single board, and clicks together to form a harmonious look and feel throughout your room. When you’re ready to move forward, you’ll find vinyl planks in many sizes. In terms of width, you’ll find width in the 6” to 7 ¾” range, perfect for mimicking the look of a real wood plank board. Length will typically be around 48”, which can be considerably shorter than real wood, which can run as long as 12 feet long. What makes vinyl realistic or not is its ability to be surface embossed. If you hold a vinyl plank at an angle, you will see texture that provides the look of real wood. Vinyl can take on all kinds of looks and textures, even heavily antiqued or distressed wood and hand scraped. Keep in mind the more texture, the thicker the plank should be in order to hold the pattern through and give it dimension. Above all, vinyl plank flooring wins in heavy traffic areas, and areas where you may receive more water and moisture than others. It’s a perfect choice for entryways, hallways, and even kitchens and bathrooms. Think vinyl plank flooring is the perfect choice for you? Stop by today and take a peek at your options. You will be surprised at how easy a choice this can be.